Korg Module looks set to be suitable for performers and producers. 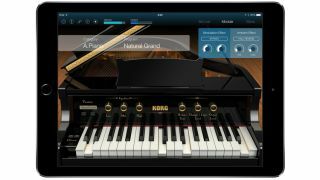 Korg is set to add to its line-up of iPad music-making apps with the release of Module, a "high-quality" sound module app. This ships with a 1GB library of keyboard and grand piano sounds, with more being available in expansion packs. There are five sound engines on board: Acoustic Piano, Electric Piano, Clav and Organ are self-explanatory, while Multi covers strings, brass and synth tones. The currently-announced expansions are a concert grand piano from Synthogy, developer of the acclaimed Ivory plugin, and a Wurlitzer piano from Korg. Unsurprisingly, Module supports MIDI input, meaning that you can play its sounds from an external keyboard, and if you also own Korg's Gadget music production app, the five engines will appear as additional 'Gadgets' in there, too. The set list function, meanwhile, lets you recall sounds in a specified order, view music notation or play music. Module also contains a recorder, and your performances can be exported directly to Soundcloud or shared on Facebook or Twitter. Other supported standards include Inter-App Audio, Audiobus, CoreMIDI and Virtual MIDI. Korg Module will be released at the end of November. The price is still to be confirmed.